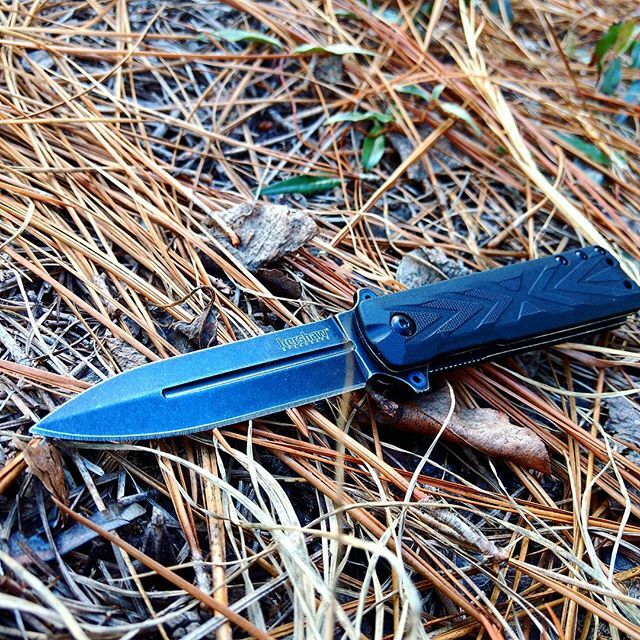 Kershaw Barstow 3960. Folding knife, yet deploys into a dagger! The Bar better watch out and move over because the Barstow is here in full effect. With the flip of the flipper, this 3 inch blade comes out with a slim and sleek blade with a very sharp spear tip end. 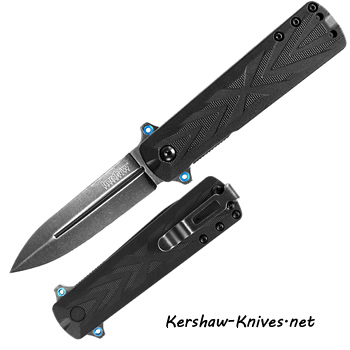 The blade is made of 8Cr13MoV stainless steel with Kershaw BlackWash coating for a non-reflective that give it an already-broken-in look. Two cobalt blue tubers are on both ends of the dagger, this will keep your fingers off the blade and also add some nice color to this full black knife. Handle has glass-filled nylon and a neat design Xd on it, handle alone measures 4 inches. Pocket clip is black and a deep carry, can be changed from left to right with only a tip up position. Liner lock system. Barstow- Let's do this Dagger style!